For Paul, while life was often very hard, I believer he had a simple approach to life. He was a “one thing” (see Philippians 3:13) sort of guy, living in a simple dependence upon His Father. Even in abundance, life was simple because he didn’t let “stuff” clutter his devotion to and dependence upon Christ. When we live like this, we are reminded in wonderful and mysterious ways, that God (not our retirement plans) becomes our food and drink, our sustenance for life in this world. Simple is not Easy! I mentioned in the introduction that when I set out to hike a small sliver of the AT, I had originally planned a 13-day 165-mile trek. I finished, 6 days and 63.7 miles later, deeply torn in toes and emotions, and more than a bit disappointed. What happened? The big answer can be summed up in two words: ignorance and blisters! As for ignorance, I truly had no idea what I was doing. 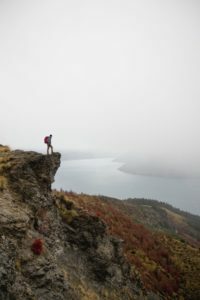 I had never backpacked before, all my gear was new, but I remember thoughts such as the following . . . I should’ve caught the Shenandoah National Park Ranger’s ominous tone when, upon looking at my hiking plan asked, “Do you have any idea what it’s like to hike in Virginia’s humidity and heat this time of the year?” I brushed him off, saying something like I was born and raised in central Illinois and was used to heat and humidity. (I later learned that for the first 3 days of my hike, a heat-index record was set for those dates. Something like 115 degrees!). But, ignorance and all, I was chipper and excited to go. Until the blisters! I walked so fast and furious the first day (14.5 miles with a much too heavy pack! ), blisters began to appear. Sleep was good the first night, as I set up camp at a shelter, thoroughly exhausted as I had hiked 15 hours that day. I attribute this to ignorance as well! I had no idea it would take me that long. After all, I averaged 15-20 minute miles in my training around my home in Grand Rapids Michigan. Yet, on the AT, it took me on average, about one hour to hike one mile. “Simple is not easy!” The difficulty of the task become clear as my feet got worse with each step. I was told later that my boots should have been a half-size larger! I simply couldn’t walk any further, so, I stopped walking, hitched a ride into town and found a hotel. I was both mad and sad because I felt like a failure, but relieved that my open-blistered feet could rest. Again, I was remind that this “simple” hike was not to be mistaken for an easy one. Keep Walking! I’ll spare you any more recounting my many rookie backpacking mistakes. I hope someday that I’ll have both the time and health to take another crack at the AT or some other trail. Upon exit from the AT and reflection at the end of my sabbatical, I was asking God some hard questions. The sabbatical had afforded me the time where I had just begun to enter a rhythm of rest, and felt ready yet somewhat apprehensive to re-enter vocational pastoral ministry. I asked God a simple question. “Now what do I do, how do I keep this healthy rhythm of work-rest going?” The answer I received from God was immediate and clear: “Keep Walking” He said. “Keep walking”. So, I have walked. My walks have become my prayers. I listen. I talk to Him, but often I’m just there, present before Him. Nothing spectacular or flashy, just step-by-step, being before Him. Upon return from sabbatical and my reentry into ministry in November of 2007, my daily minimal goal is 10,000 steps. As of 11/10, I have walked a total of nearly 11,000 miles (and counting!) of walking. There has been only one day (Dec.13, 2009 – terrible flu!) where I failed to meet my minimum goal. Walking (with God) is changing my life. It has kept me both sane and satisfied. More of that later! Again, “simple” should not be equated with “easy.” Life can be hard and heart-breaking. You don’t have to live long to realize that. But the hardness of life can be softened a bit as we focus on a simple trust in our Heavenly Father, reminding ourselves that He knows and loves to meet the needs of His kids. I would suggest that life gets complicated when we focus too much on the “in between” stuff in our walk rather than the walk itself. We do this, I suggest, when we want to control the details of life, how our walk will look, how fast or slow we’re walking, instead of just putting one step in front of the other and simply walking, trusting that God superintends our walk, whether or not it’s going like we had planned. . God’s Word, we are told, is a light, not for the entire “trail”, but for our path, that is, what is right in front of our feet. Just walk, or, as Bryson suggests, ask God for a willingness to trudge. I know in my own life, after I am finished blowing out all of my excuses of why life is so “hard”, it often comes down to the question, “am I willing to walk?” “Trudge” is a good word to describe our walk in this world! Don’t you sometimes feel like you are trudging along? Complications come when I tell God that I’m willing to trudge as long as . . . In my six-days on the trail, I began to remember my Good Father again, and, while life can be hard, lonely, and confusing, it is really simple in its essence. The simplicity is found in being unencumbered by things and in a heart that then echoes the lyrics to the song mentioned above, “Walk With Me Lord”.